One <?xml:namespace prefix = st1 ns = "urn:schemas-microsoft-com:office:smarttags" />Saturday in February, I went to a meeting of women in Kibera, Nairobi. It was in the open, in the field next to the Kibera District Officer’s office. Under a tree, next to a dusty soccer pitch on which a few energetic children were playing, sat some women listening to the meeting’s moderator, Ms. Jane Anyango. They looked like birds of paradise, in the shade of the tree, all bright colours and wraps and headscarves and skirts—laughing faces upturned as they listened. These women are amongst the hardest-hit victims of the recent post-election violence in Kenya; some of their houses have been burned, their small businesses have been disrupted, their sons endangered and their husbands missing. They live where police bullets sometimes fly through walls and strike women dead as they stand ironing clothes, where a police presence might mean a son shot in running battles. 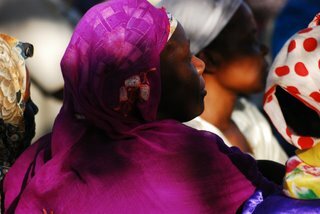 These women meet under a tree, out in the open, because they have nowhere else to gather, no shelter in case it rains. They did not even have chairs: they sat on the hard, red-earth ground. The ladies in Kibera meet anyway, because they are extremely tired of having their lives dictated to, by and for people who do not care about them and do not even know that they exist. Across the street, dusty matatus picked up passengers and scrambled for space, jostling and nudging their way to faster speeds and more passengers. The women didn’t seem to notice: they were so wrapped up in their own affairs, and so determined to succeed that they could ignore the outside world a few feet away from them. They are going to change their lives by themselves, by telling their own stories and managing their own fates. They are tired of being talked for and being talked about, even if they do live in “Africa’s largest slum.” They are tired of being talked about as if they do not have wills, or ideals, or ambitions, or successes. They were singing: as we walked up to them, they broke into a song of welcome and made space for us, under their tree. When we left, they invited us back for next week. A few hours later and a whole world away, we walked up to another group of women, in Nairobi’s green and manicured suburb of Loresho. These women were gathered on a friend’s porch, and gleaming cars lined the driveway and the courtyard beyond, like a praise-poem to Nairobi’s middle class. This group of women have everything the Kibera women want, but they met anyway, too. They met because they are tired of being told what their identities are, whom they should love and hate and want to meet with or date, because of ethnic differences. Some of them went to high school together, some met just the other day, some are friends of friends, or colleagues, or neighbours. Their children play and grow up together. They meet to re-affirm their friendships and to laugh away the silly barriers that the politicians want to erect between them. These are professional women, highly accomplished and authoritative about it—someone started to say “parting is such sweet sorrow.....” and they all chimed in with the rest of the quote, in fact, with the rest of the whole bit from Shakespeare, as if it was a perfectly normal thing to know. That’s the kind of thing they do, chortling madly all the time, screaming with laughter at the absurdity of thinking of each other as Kikuyus or Kalenjins or Luos, when they had been together a-a-a-al that time, all those years ago and all the long years since. When they were young and mischievous, they had been on a school trip to the Nairobi Show, and they had all abandoned their teacher and turned their watches back an hour so they could argue her down when they came back late.....ati stop talking to my best friend because she’s a Luo? Don’t be stupid, please. They are having none of it, none of it at all: and as they sniggered and laughed and recalled their old nicknames for each other, the air around them lightened, and relaxed, and made space for everybody. In Loresho, it was a different kind of tree, and a different kind of world, but when we left, they invited us back for next week. Sisters at heart, these women are: from Kibera to Loresho. Kenya would be safe in their hands. Wambui Mwangi is the editorial director of Generation Kenya and an Assistant Professor of International Relations at the University of Toronto. She divides her time between Kenya and Canada.